New York is the place to be. Everyone who is anyone visits New York and its myriad of sights and attraction. Feel like one of NYC’s most exclusive residents as you glide in to Teterboro airport onboard your private jet. The Big Apple, home to some of the world’s most famous celebrities, names such as Drew Barrymore, Leonardo di Caprio and Tommy Hilfiger echo through the bustling streets. Experience the thrill and hubbub of activity that is provided in the City That Never Sleeps! 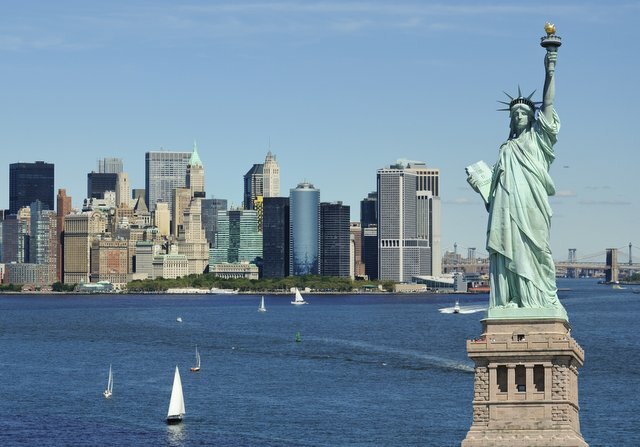 New York is the United States’ most populous city, it is a global power house that consists of five boroughs; Brooklyn, Queens, Manhattan, the Bronx and Staten Island. Each borough has its own cultural significance in the eclectic atmosphere that makes up New York. There are an exceptional number of places and sights that are absolute must-sees! If it is your first vacation in NYC, it is likely you are going to want to spend hours wandering the historic locations. Navigating your way around New York may seem a challenge at first, however it is amazingly well structured with corresponding street names that will lead you efficiently to your desired destination. First and foremost, a visit to the renowned Times Square should be at the top of your list. Located in Midtown Manhattan, Times Square is a blizzard of bright lights and a throng of people from all walks of life. Everyone knows the Statue of Liberty, due to its all-encompassing size, and its prominence as one of America’s landmarks. Allow your curiosity for this exceptional totem to be satiated; book advance tickets for your trip and go to the very top of her by climbing in to her crown. Once up there, you will witness the amazing New York City skyline from afar. Some other must see attractions include Ellis Island and the Empire State Building, offering further panoramic views of NYC. Others include Carnegie Hall, the Yankee Stadium and Little Italy, to name but a few! Famous people run amok through New York, in the bars, restaurants and clubs; whether they are a crazy teen popstar or a demure actress, there are a pick of celebrities. If you want to experience heavenly cuisine and dining, make your way to the sleek Japanese-Peruvian restaurant, Nobu, frequented by the elite. Situated at 105 Hudson Street, delight in the intriguing and delectable tastes, whilst perhaps seeing faces such as Madonna and Cameron Diaz. Another amazing hotspot with a wonderful dining experience is at The Spotted Pig, a unique restaurant that’s served brunch, lunch and dinner to names such as Julianne Moore, Maggie Gyllenhaal and David Duchonvy! It serves both Italian and English cuisine at affordable prices, nonetheless with locally sourced produce and a fantastic chef! Desperate For Some Lush Greenery? Do you feel a little weary after wandering around such an extraordinary city, a concrete jungle punctuated by bright lights and diversity? Perhaps you should indulge in a trip to Washington Square Park, found in the heart of Greenwich Village. On the weekends you will likely see a combination of people relaxing, with a number of street performers, ready to appeal to your inner artist. This iconic park will give you the freedom to lounge and enjoy the NYC sunshine, whilst being able to visit the Washington Arch and the nearby fountain.